Self-guided walking on the Way of Saint James from Saint-Jean-Pied-de-Port in France, the Camino Frances (The French Route) reaches Santiago de Compostela in 37 nights and 778 km, hotels, dinners and luggage assistance. This tour includes the hotels, meals, luggage transfer, one guide book, maps, English speaking email or phone assistance. The full Camino Frances (The French Route) from St. Jean Pied de Port to Santiago de Compostela is made up of 36 stages in this suggestion of program. If you find some of the stages too long or not enough this self-guided itinerary can be customized according to your level of walking or your plans. We have included 2 rest days in Burgos and Leon but we can add more rest days or move them off if you prefer. Just ask me what you would like and I will tell you how it is feasible. Saint-Jean-Pied-de-Port - Roncesvalles- 26 km - 6h30 walk. Ascent : 1400 m. + 1400 m / –786 m First step of the crossing of the Pyrenees, the gateway to reach the Roncesvalles pass. 1400 meters of ascent : this is one of the toughest part of the Way. The Camino Napoleon is a mythical part of the Camino.Take time to visit the "Collegiate Church" in Roncesvalles. Overnight in a HOTEL in RONCESVALLES NOTE: This day can be split into 2 stages of 12km and 14km if you’d like to walk at a slower pace.You can also be transferred up to Orrisson to shorten this stage. Najera- Santo Domingo de la Calzada- 22 km - 5h30 walk. Wonderful wide country tracks through vineyards, cereal crops and gently undulating farmland. Arrive into the famous Santo Domingo de la Calzada along the main road .”Saint Dominic of the road” has dedicated most of his 11th century life to improving the Way of Saint James for the pilgrims. Night in the village. Belorado - Atapuerca - 30 km - 7h30 walk. A section of this stage is along the road but you will leave it quickly to enter rocky trails and grassy paths. After Villafranca you will follow the steps of the medieval pilgrims who used to fear these forests and moor lands because of the wolves and burglars, and you will reach San Juan de Ortega which is one of the highlights of the Way. Atapuerca - Burgos - 17 km - 4h30. The walk today will lead you to Burgos, through thick forests, bold hills and desertic villages. Burgos - Burgos is too rich in monuments to make a complete list, but take the time to visit the Gothic Cathedral Santa Maria, one of the most beautiful in Europe. Burgos - Hornillos Del Camino - 19 km– 5h00 walk A long walking day to leave Burgos and head into the countryside where the crop fields of the region will soon appear.The Camino follows lovely tracks through farmlands, pastures and crops towards Hornillos walk up to a plateau before descending to the valley of the River Bol and Castrojeriz. 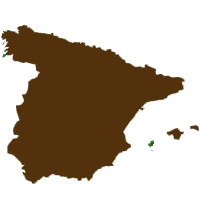 Hornillos Del Camino - Castrojeriz- 19,5 km – 5h00 walk The heart of the Meseta is rich in Romanesque churches, poppies and wheat fields. The medieval bridge over the Rio Pisuerga takes you to the Palencia Provincia and Castrojeriz. Castrojeriz - Fromista - 25 km – 6h15 de marche The way follows the towpath of Castilla Canal, a haven of freshness, up to Fromista. Along the way take a moment to visit the 14th century church "La Asuncion" in Boadilla. The church is renowned for its gothic architecture and the gorgeous carved baptismal font. Fromista - Carrion De Los Condes - 19km – 5h00 walk Walk towards Carrion on the tarred historical road which farther turns into a very lovely dirt track through fields to finally end in the vestiges of Carrion de los Condes. Carrion De Los Condes – Calzadilla De La Cueza - 28 km- 7h00 walk Monotonous straight line which will lead you to enjoy the silence of the day and enjoy the area. You will pass through the village of Calzadilla de la Cueza with dried mud brick houses. Calzadilla De La Cueza - Sahagun - 15 km - 4h00 walk Follow the path towards Sahagun and the three brick Churches. Keep straight on the path to El Burgo de Ranero. Sahagun - El Burgo Ranero -18 km – 4h30 walk This famous monotonous straight path leads you to El Burgo. El Burgos Ranero- Mansilla De Las Mulas- 19km, 11 miles - 5h00 walk Today, you will pass the pretty village of Reliegos on your way to Leon. You have 2 route options to reach Mansilla, an ancient stronghold town which is still a charming place surrounded by fortress walls. Mansilla De Las Mulas- Leon 17km, 11 miles – 4h30 walk A short stage which starts in crop fields on your way to the vibrant Leon. Take the time to visit the Cathedral San Isidoro and San Marcos which are the treasures of Leon and stroll through the streets which converge to the Plaza Mayor. Leon – Take the time to visit the Cathedral San Isidoro and San Marcos, the medieval streets around The Plaza Mayor, which is the heart of the lively city. Leon - Villadangos del Paramo - 22 km - 5h30 walk. Follow the Camino Real along the N120 road. The track leads you to Villadangos. HB and night in your hotel. Villadangos del Paramo - Astorga - 26 km - 6h30 walk. This stage takes you to a quaint village named Hospital de Orbigo with its long and famous medieval bridge. Keep straight on along cultivated fields and green oaks woods, the Leon Mounts stand out on the horizon. You arrive in Astorga, the crossroad of two main routes, the French way and the Via Plata starting in Sevilla. The Cathedral, churches, convents and hospitals are the witness of its glorious past. HB and night in your hotel. Rabanal del Camino - Ponferrada - 32 km - 7h15 walk. Ascent : 1500 m (It is possible to split the day and to sleep in Acebo (with 2 x 16 km walks) There are three distinct parts during this walking day: the 1500m ascent of the Cruz de Ferro, the moor landscape and then the way winds down to the village of Acebo through a dramatic mountain landscape. The Bierzo Valley is enclosed westward by a mountainous frontier before Galicia. You are in Ponferrada protected by its fortified towers. HB and night in your hotel. Ponferrada - Villafranca del Bierzo - 23 km- 5h45 walk. Despite the recent urbanization of Ponferrada, you will discover a great architecture in Camponaraya and Cacabelos. In Villafranca del Bierzo you will enjoy the wealthy heritage. HB and night in your hotel. Triacastella – Sarria 21 km- 5h30 walk. Here you are in the rolling Galician landscape, uphills and downhills, farms and brooks, chapels and wayside crosses. Here is the real Galicia landscape !Night and Half board in Sarria. Sarria - Portomarin – 21.5 km – 5h30 walk. After a short drive from Samos to Sarria, the way crosses over a medieval bridge and through a Chestnut tree forest, from one hamlet to another linked by trails bordered by high stonewalls. In Portomarin the San Juan fortified church is worth the visit.Night and Half Board in Portomarin. Portomarin – Palas del Rei – 24 km- 6 h walk. The way continues through peaceful villages to Hospital de la Cruz where begins eucalyptus forests. Arrival in Palas del Rei. Night and Half Board in Palas del Rei. Palas del Rei – Arzua – 26km – 6h30 walk. On the way admire and observe the beautiful traditional houses. Arrival in the historical city of Arzua.Night and Half Board in Arzua. Arzua- Labacolla- 26 km- 6h30 walk. Another long day which is very important before reaching St James : here the tradition among the pilgrims is to wash before honoring St James. Night and Half board. Labacolla- Santiago- 12 km – 3h walk. The last walk to the Monte Gozo, before walking under la Porta do Camino (the Door of the Way) that opens on Santiago de Compostela. Night and breakfast in Santiago. The Dinner is not included. Santiago End of your travel after breakfast. English assistance for your reservation. 2 and 3 star hotels and Casas rurales (2 or 3 star hotels in the cities). En suite bathrooms. (6 dinners excluded in the cities : Saint Jean Pied de Port, Pamplona, Logrono, Burgos, Leon and Santiago). An English road book with the description of your program and full detailed walks with a map. English-speaking phone or email assistance. Your travel to the start and from the end of the trip. All lunches. Dinners in Saint Jean Pied de Port, Pamplona, Logrono, Burgos, Leon and Santiago. Starts in : Saint Jean Pied de Port. Ends in : Santiago de Compostela.